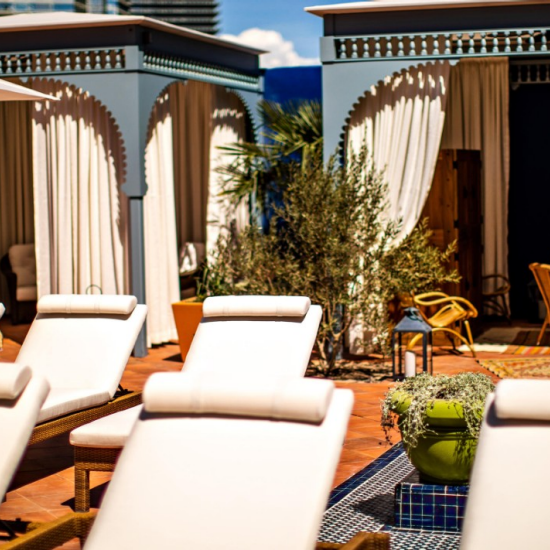 On Fridays, Saturdays and Sundays, The NoMad Pool will transform into JEMAA - The NoMad Pool Party. A seductive and energetic daytime experience, JEMAA will feature the cocktail explosions the NoMad Bar is renowned for, tableside service, a roster of DJs and artists delivering nuanced music programming — including a tropical house vibe on Sundays — and even a cocktail fountain that can be delivered to the cabana for guests who really want to step up the action. With the team devoting the same level of detail and design to the pool as it is known for in its hospitality venues in Las Vegas, New York and Los Angeles, JEMAA will set itself apart as the new daytime destination in Las Vegas. Walk straight past Primrose and guest services and then make a left. The pool is located straight ahead.